With a stay at Stazione Centrale, you'll be centrally located in Bologna, within a 15-minute drive of BolognaFiere and National Art Gallery of Bologna. 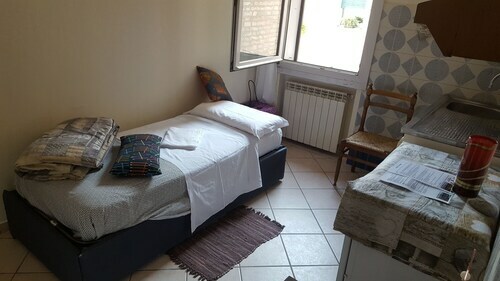 This bed & breakfast is 1.9 mi (3.1 km) from University of Bologna and 2.2 mi (3.5 km) from Piazza Maggiore. Make yourself at home in one of the 4 air-conditioned guestrooms. Your bed comes with down comforters and Frette Italian sheets. Complimentary wireless Internet access is available to keep you connected. Bathrooms feature showers, bidets, and hair dryers. Take advantage of the bed & breakfast's room service (during limited hours). Wrap up your day with a drink at the bar/lounge. A complimentary buffet breakfast is served daily from 7 AM to 9 AM. Featured amenities include dry cleaning/laundry services, luggage storage, and a safe deposit box at the front desk. Self parking (subject to charges) is available onsite. Take advantage of the bed & breakfast's room service (during limited hours). Wrap up your day with a drink at the bar/lounge. A complimentary buffet breakfast is served daily from 7 AM to 9 AM.Take in the views from a garden and make use of amenities such as complimentary wireless Internet access.Pets allowed Check-in time starts at 1:30 PM Check-out time is 11 AMFeatured amenities include dry cleaning/laundry services, luggage storage, and a safe deposit box at the front desk. Self parking (subject to charges) is available onsite.Extra-person charges may apply and vary depending on property policy.